The H-653 to the right was sold new by Mack to CF for testing triples in the state of Oregon. It is a long story and I believe I have shared it on this site before. It is a true fact as at the time FL did not make a BBC with the needed power that this H model could do so they bought it for the trial runs. Note the fuel tanks, air horn sideways and a few other "required CF" options. The model year from Mack shows a 1957 but then again it resurfaces as a 1959 sold to Haney truck lines which is also who bought the one to the left new in 1957. Both are turbocharged thermodynes with tri plexes. I had Ken Self of FL fame confirm the purchase of the H model. You need to hire me as your PR person!!! She whisked you away so fast .........it must have been that smile of yours? Never did see you..............or her after that??? Does anyone have a source for the chrome front fender guards? I knew Bob Brown very well and he built the LTL. It has a 300......maybe 320 iron lung. Not sure if it is oil cooled pistons or not? The sleeper was hand built and he took Brown trailer emblems and put on it and would tell folks that it was very very rare!! Why Cummins for Volvos and not newer Macks? I have been in both the KW and Peterbilt assembly lines of late and they ARE the same truck other than the 2 out of 10 old style cabs for each. There is not much difference in the KW and Pete anymore. most all of the frame and other components are Paccar branded. They share the engine as well along with cabs. I understand that the intent is to stop the production of each brands individual cabs soon. A Volvo and a Mack are truly very different trucks considering cabs and some Mack exclusive components. 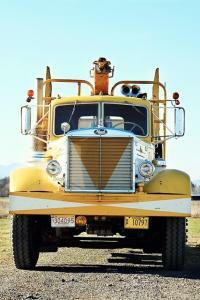 More so than the Paccar product. A few Mack ads for the western logger. Zenon Hansen used his long established connection with the Murty Bros from Portland OR to build the first Hayward built R model for logging. It was displayed at the different logging shows that year. There was an article and picture in one of the old Bulldog mags. Remember the deep candy red Superliner logger that was on the Mack calendar years back? I was just informed it is still a beauty and in storage from by the original owner. I spotted a log dog at the local Mack dealer this week. It is based in Yreka, CA just over the hill.